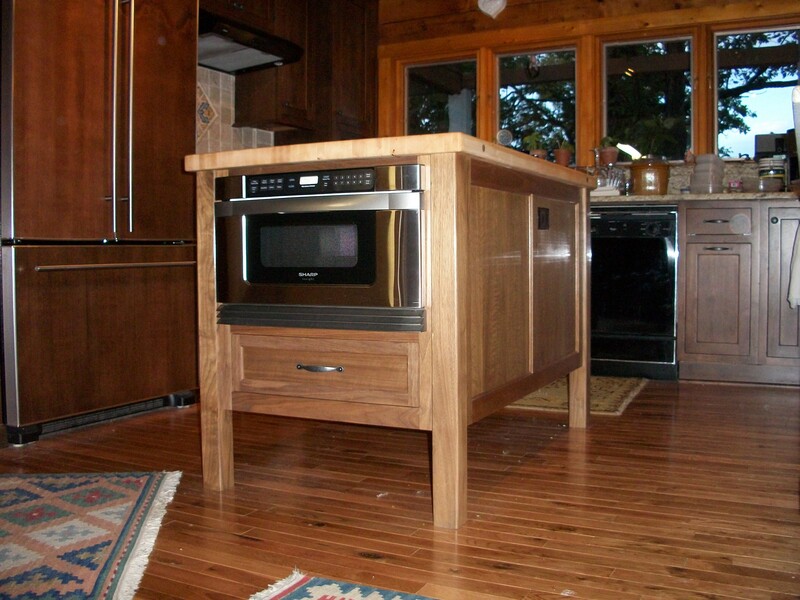 This is a story from a gentleman who is a retired air force officer whose hobby is cabinet and furniture building, As you’ll see he is an incredible cabinet builder. As his shop is in his garage with limmetted space and no spray booth Dennis was interested in water born products but needed something that was super tough. I suggested the Rexcell Water based Conversion varnish. As you will see it turn out stunningly beautiful. Fore note: this product is no longer manufactured by Rexcell but is now being manufactured to spec by another American manufacturing company, the product is as good or better than before, It has been referred to as three different manufactures Renner, Rexcell and now CIC. It is all the same product, a water born Conversion Varnish. I was spraying in 90 degree summer weather and therefore added 3 percent of regular lacquer retarder. Greg, the sales rep, said I could thin the product with water by about 10 percent but I used it full strength and it seemed to spray very well. I am used to spraying regular nitro cellulose lacquer and I used the very same technique with this water based lacquer. It appears milky in color when it first goes on but otherwise it sprays on like regular lacquer. You have to use the same caution on vertical surfaces as with regular lacquer. A good technique is to use a big piece of brown cardboard to adjust your spray volume and pattern before tackling your project. I sprayed three coats and sanded lightly between coats. I probably could have gotten by with only two coats. Remember, each coat of this water based finish lies on top of the previous coat. It doesn’t melt into the previous coat as with regular lacquer. As with regular lacquer, this product dries quickly and can be sanded within 20 minutes and recoated. It was hot and dry when I sprayed so weather conditions might alter the drying times. After the third coat, it was a bit too glossy for my preference so I waxed with a steel wool pad which resulted in a soft sheen that I was looking for. I’m totally happy with the way it turned out. I kept a bucket of water and a rag nearby while I was spraying. A couple of times when I got runs, I immediately wiped it off, let it dry, sanded lightly, and recoated. I really enjoyed the water clean up – of the runs and the clean-up of the spray equipment. A word here about clean-up – and this attests to the durability — if you wait until this finish dries, you can’t clean up with water – it takes acetone. I sprayed the first coat with my regular glasses on (plastic lenses). I got overspray on my glasses and I still haven’t gotten it off. However, acetone on my plastic lenses would probably not be smart. I made a silverware tray at the last-minute for one of the cabinet drawers and I brushed on two coats of finish with a foam brush. That went on very nicely too. Will I continue to use water based finishes? — definitely yes, especially for kitchen and bathroom furniture. Will I use it for living room furniture? – the jury is out, but I’m hoping to. Here is another picture of Dennis’ work. 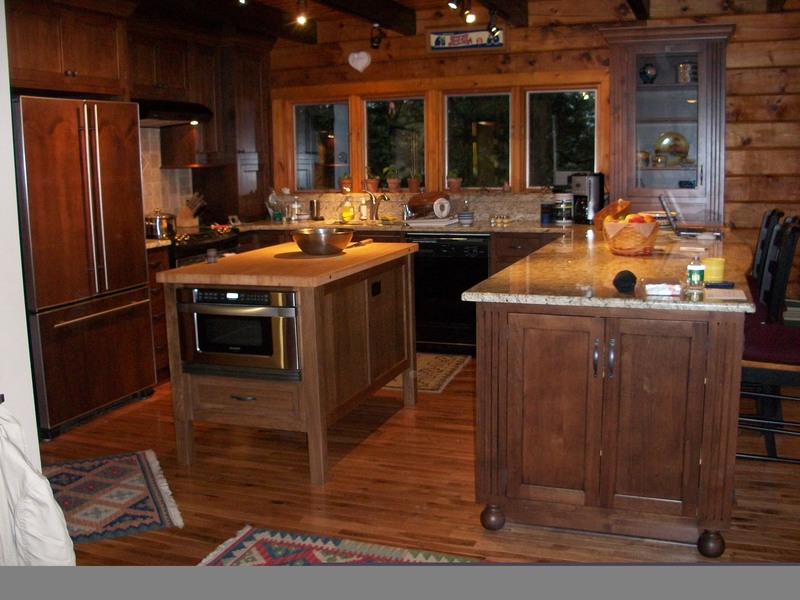 For note this stunningly beautiful Kitchen Island was built by Dennis for his daughter who recently returned from active service in the Military in Iraq. For his privacy, I have left out Dennis’s contact informations, However, you are welcome to comment on his work and ask any questions on this blog. If you are intersted in contacting Denis for custom work please send me an e-mail and I’ll foreward it on to him.